The first three phases brought us consumer wellness and a transfer from global agricultural to industrial and logistic processes around retail. They all built up towards the fourth phase (making money without doing anything other than keeping wealth away from others) which brought us finally the crisis situation today. The fourth phase could not exist without the preceeding three. For 300 years morality has followed the industrial era through the development of a care taking government (education and health regulation) to counter the greed and self interest of industrial kingdoms. Wars have been faught and political systems developped with left and right wing challenging each other through argumentation. Constitutions were written for human rights and governance while economic systems grew causing concentration of humankind in urban megastructures. The phase of speculation finally unified greed up to a clear break up of human balans. The ecological and social consequences were so large that a fifth entrepreneurial phase announces itself. It is an entrepreneurial phase that does not just affect business but also governance, education and the individul awareness. behavior and mentality. In fact, the fifth phase is not a linear continuation of the former four, it is the very first post industrial and post economic phase announcing the global transformation. Entrepreneurial phase 5 is dedicated to save humankind within its natural habitat. This phase I refer to as sustainocracy, the compulsory focus on the sustainable preservation and continuation of the species. 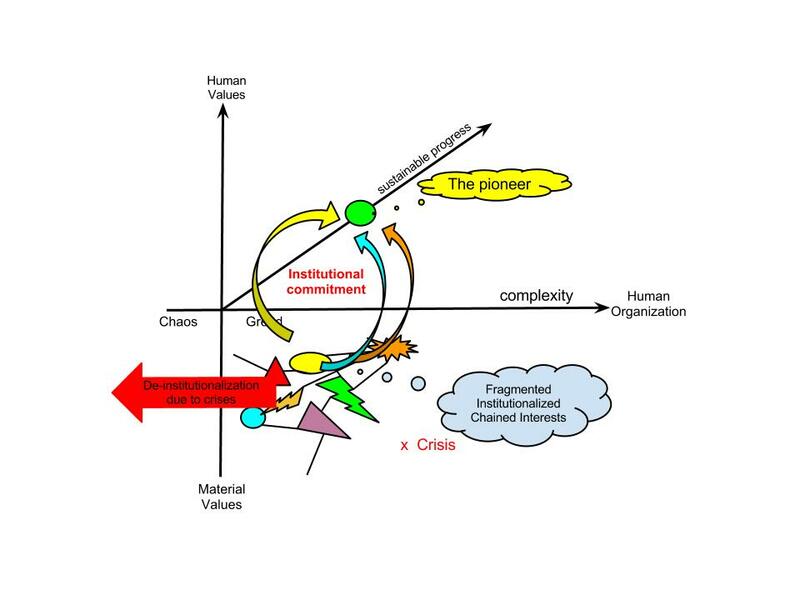 It is a complicated phase because it ends a periode of perceived global luxury to replaced it with the indvidual and collective need to take responsibility. It puts the world upside down for most people and institutions. The phase is therefor preceded with a large period of overall political, executive and public negation which will cause death and disaster beyond any historic precedence. Those who are to blame will still be alive when all this happens and judgment day will surely confront them publicly in due time. This entrepreneurial spirit of the fifth phase is however already building up throughout society, as my AiREAS venture (air quality, human health and city design) shows. It is not just individual anymore but also affecting the motivation of the large powerblocks of current humankind. These many people who use their personal motivation also in their institutional jobs to make a difference, have reached the point already of enlightenment and personal commitment to a new future. Sustainocratic processes lead the way, even if they are still small, fragile and extremely localized. Step by step these purpose driven ventures based on phase five of global entrepreneurship will build up enough power to break through the lethal dominance of the speculants of phase 4. Important for everyone is to recognize and understand phase 4 and the transformative phase 5. Then the process will only speed up reducing the potential human suffering of phase 4 to an absolute minimum. Anyone can become a phase 5 entrepreneur. And when you do you’ll become aware that there is a lot of entreprenerial work to be done as simply everything made and organized by human beings needs to be changed. It will keep us passionately occupied for centuries to come. By Jean-Paul Close in 5K world, multidimensional world, Society on July 6, 2012 .